Better late than never! It’s time to welcome July with a quick look back at June. 1. Get my mileage up! (2/4) I did pretty well with this for most of the month. Even though my mileage wasn’t as high as it needed to be, I was pushing for long runs and running more often. The last week in June definitely suffered after Buddy’s accident. I’m looking forward to really kicking up a notch in July. 2. Weight train (at least once a week). (4/4) They may have not happened once a week as planned, but I did get (at least) four strength training sessions in. Sometimes it was just arms, sometimes it was the P90x “Ab Ripper X” dvd, sometimes it was both. I can’t wait to continue this and see my running and fitness continue to improve. 4. Get Laptop fixed. Seriously, Anna. I did get an external hard drive for our fading desktop computer and I got a wireless USB thinking that might fix our laptop connectivity problems. But, unfortunuately, it still doesn’t recognize our home wireless even though all our other electronics do. 5. Make a savings plan for summer fun trips. Hubs and I knocked this out pretty quickly. We’ve been following it successfully as well. 6. Make four new recipes. (3/4) Again, I think I could have nailed this if we hadn’t spent the past week in a daze/frenzy after Buddy’s run in with a car. Still, three new recipes isn’t shabby! Quinoa salad for lunches, pound cake, and Thai Chicken Soup — I would make all of these again! Time to look at July! 1. Try out four new recipes. 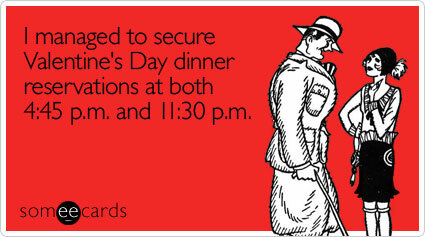 I already have at least one in mind for next week! If we’re staying in with the hound for “house arrest” we might as well eat some good things! 2. Run 45 miles in July. After my Saturday run, I “only” need 42.5 more miles! 3. Read six books, three non-fiction or classic. The Kindle has been spurring on my reading. And with “hound house arrest” I should be able to read even more. 4. Share at least two book reviews. I’ll aim for our current book club pick and something perhaps a little fluffier. 5. Complete six strength training sessions for the month. I like seeing my body get stronger and my running get better. 6. Post at least 10 times this month. What are you up to this month? Any suggestions for books to read or recipes to try? I’m all ears! Hubs was actually out of town for Valentine’s Day proper. Combine that with the fact that we don’t like battling crowds and you’ll realize that, for us, celebrating Valentine’s Day a little late was just fine. Hubs came back on Friday with reservations for Restaurant Eve’s Bistro Room. Restaurant Eve is the brain child of Cathal Armstrong and is the sister restaurant to Eamonn’s (fish and chips), PX (speakeasy), and The Majestic (upscale casual dining). They feature a three course meal in the Bistro Room on Friday and Saturday nights as well as a Tasting Room with five, seven, and nine course tasting menus. Eve is so awesome that they will even specially make a menu for those with dietary restrictions so Vegetarians, Pescatarians, Gluten intolerants, etc. have no fear! Hubs picked the beef tartare with rye bread and I went with the papri chat (an indian themed dish with chick peas, onions, and a variety of sauces). Both were delicious and sizeable servings. For our main course, I got the rib eye steak with marrow sauce and chantrelle mushrooms while Hubs opted for pork belly. My dish was one of the best things I’ve eaten. I’m not a big red meat eater (or, meat eater for that matter) but I knew this was the place to go for it if I wanted to. The steak was ENORMOUS compared to what I was expecting and the chantrelles added something special. I wanted to head into the kitchen, find Mr. Armstrong and give him a huge hug. Hubs said his pork belly was surprisingly spicy but he happens to love heat so that’s a good thing. We also split a side of beet and bacon risotto which I could easily request as a final meal (were I on death row). Neither one of us could finish our meals, but our tummies were very happy. We ended with fantastic desserts. I selected, on the waitress’ recommendation, a caramel-orange-chocolate tart and had to restrain myself from picking up the plate to lick afterwards. Hubs went with the creme brulee which had a side of little cookies and chocolates. I snuck a little bite of everything and his was almost as good as mine. The verdict? Restaurant Eve was a WONDERFUL place to celebrate Valentine’s Day. The service was great, the drinks were strong, the food was impeccable. It is on the pricier side but it’s one of the only places in DC where I feel like I’m getting more than what I paid for. Other positives: Eve uses a lot of local and organic products which I love! They also allow you to order ala carte from the Bistro menu and “bar food” menu (which serves deviled eggs)! Hubs and I went back a week later to eat in the bar and had a wonderful (much cheaper) meal. Finally, if you work in the Old Town area or are there around lunch time, they do a $15 lunch that is supposedly delicious. Oh, and if you need an eating buddy, just let me know and I’d be happy to accompany you! Sometimes, in life, we stumble upon things that move us deeply. Simplicity, kindness, beauty, size. I’ve always liked to look for inspiration and I love feeling, that stir, that comes along with being moved. It makes you want something bigger than yourself and it brings all of your issues and problems into perspective. Recently, I was fortunate enough to pick up a copy of Greg Mortenson’s Three Cups of Tea at a book club book swap. It has been on my “to-read” list for about four years and I was excited at the chance to mark another book off the list. The subject matter teetered on my areas of interest (the Middle East) and I found the gist of the storyline (building schools for underprivileged children, especially girls, in Pakistan and Afghanistan) intriguing. I was expecting to enjoy the book, but I was blown away. I’m not sure if I can adequately put into words how I felt about this book. Mortenson, a mountain climber, winds up in a poor area of Pakistan by accident after a failed climb. This series of seemingly random events transform his life and the lives of villages across Pakistan and Afghanistan. Three Cups of Tea tells the story of his mission to bring education to some of the least privileged people in the world. His travels take him far from the “civilized” world that we are comfortable in and, toward the conclusion of the book, directly into the heart of the start of the War on Terror. He holds that the solution to the Taliban and other forms of extremism is to provide accessible education. So many children enter strictly religious madrassas that, in some cases, teach the hatred of America and terrorism that bring us extremism and violence. With more of Mortenson’s schools, more children would have the chance to receive an education without indoctrination or dogma. These schools are not “pro-America” and they do not teach our religion or values. They provide an unbiased, fair education to children that otherwise may not receive it. Mortenson also worked to build bridges (literally), community centers for women, and medical centers to help reduce the alarmingly high numbers of preventable deaths. This is a man on a wonderful mission, and I am moved. Please, please do not judge this book based on my review – go out and get a copy for yourself! If you want to help in a more tangible way, visit the book’s web site or purchase the book using this link. Any purchase (of the book or otherwise) from Amazon using the link above gives Mortenson’s organization (CAI – Central Asia Institute) 7% of the proceeds. Y’all, half my work team is in Boston where they are getting copious amounts of snow. DC has some cold misty drizzle. I would like to trade? I know they’ll probably be stuck in an airport for a while, but still… I like to read, I love magazines. I’m pretty sure I could post up fairly comfortably at an airport watching it snow (and getting paid for it) as long as I had something to read. Okay, moving on from my serious case of snow jealousy! I had a serious reckoning moment yesterday morning with the scale. One-five-five showed up. Eeeeek! I keep writing in here about how I don’t like the number creeping up, I’m going to do something, yadda yadda yadda. But, why don’t I actually do something about it? There was some serious grocery shopping done and I re-acquianted myself with sparkpeople. (I’m AlsoAnnaBanana if you want to look for me — my profile is super sad currently.) I adjusted my calorie intakes and work out schedule on there to realistic goals and ranges. And, taking some serious inspiration from Brie, I dove back into calorie counting and weight loss. I’m eating clean, eating less, and moving more again — and I already feel better. I’ve socked aside a little extra money for some new work clothes, so I plan to reward myself when I drop some of this pesky post wedding weight. I also sat down with awesome co-worker Thea and started putting together a training plan for a half marathon. Since my goal race isn’t until Labor Day weekened, we’ve got some time to play with. Given my previous issues with my knees, a slow start is a good start. My current plan is to be comfortable running a 5k again by March 4th (six months from my race date). After that, for March and April I’ll be uping my runs from two a week to three a week with mileage ranging from 2-5 miles for each run. Then, come May we’ll sit down to map out my real training plan. I’m excited to enjoy running again. And, hopefully since I’ve aired all this out here, I’ll have some accountability. I still need to talk about that awesome blogger badge that Kelly gave me, but my work computer doesn’t play as nicely with wordpress as my home computer, so that will have to wait for a few more hours. However, I did want to share with you two of my current favorite things (on my new eating plan)! They were on yesterday’s lunch menu and will feature again today – all I can say, is holy yum! Lemongrass is one of my favorite ingredients, so I was immediately won over. The perfect amount of spicy heat, yummy flavors and little chunks of sweet potato left me very satisfied. 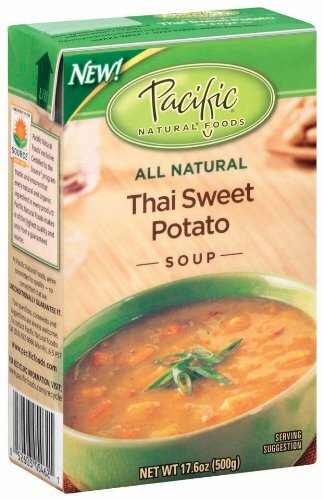 Also awesome – these soups come in two serving cartons. They’re perfect for bringing to work. Use one serving, close it up, put it in the fridge, and use the second serving the next day. I bring my lunch to save $$$ and calories, but I hate all the prep work and hauling stuff in every day. This soup just made my life a lot easier! My other love is something I’ve had before, but it has been a few months. Annie’s Organic Dressings are all around pretty tasty, but I have a profound affection for the Goddess Dressing. This is definitely the perfect way to spice up a boring salad in my book. While the $3.99 price tag (for 8 servings) makes me flinch a little, I know I’ll eat my greens with this on top of it. So, I’ll pony up the money in order to keep my taste buds happy. Okay folks, I’ve got a few clementines calling my name. I hope you’re having a snowier Tuesday than me! Ah yes, weeks later I finally have finished another book! Last night I was feeling pretty awful (let’s be honest, I still don’t feel great) so I curled up in bed to finish off Omnivore’s Dilemma by Michael Pollan. It has left me thinking about what I eat and where I get it from as well. I’d like to do a little more research and perhaps read a few more books on the matter. 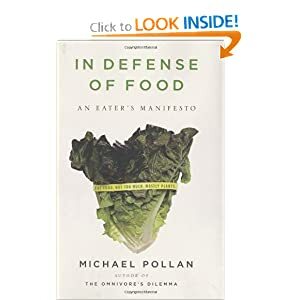 (Perhaps: In Defense of Food and Eating Animals…) However, I could definitely see myself implementing some changes based on what I’ve learned. For instance, I want to make an effort to buy more local produce. Hubs and I strive to get organic produce – especially produce that is typically known to be highly contaminated. But now I’d really like to try and shop at Farmer’s Markets more and maybe even join a coop. I also started thinking a lot about the meat I eat. I don’t think I’ll ever become vegetarian, I just don’t see that in the cards. I know and love many vegetarians and gave up meat twice for Lent. It’s just not in the cards for me. I don’t eat a lot of meat by any means, but I do enjoy it. Pollan presented some scary/interesting information about the meat we eat. After a little more research and some planning, I might stop eating meat unless I know how it was raised. There’s some scary information out there about non-grass fed animals (or, wild-caught in the case of seafood). Like I said, I need to do a little more research but I feel like some changes are coming down the line for me. Has a book ever changed the way you look at food? Should I read it?